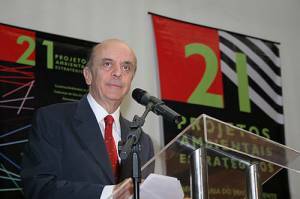 On 02 April the new Governor of São Paulo, José Serra [Brazilian Social Democratic Party (Partido da Social Democracia Brasileira – PSDB)], announced a series of 21 “strategic environmental projects” he said will guide his Administration and help one of Latin America’s biggest economies — and still the industrial and agricultural powerhouse of Brazil (accounting for around one third of Brazilian GDP) — make the transition from “talking to doing” on environmental policy. Many of the “projects” are the continuation, enhancement or completion of initiatives launched under prior administrations. Some (such as the ban on pre-harvest cane burning) intend to finally fulfill longstanding SP government promises or make concrete longstanding ideas (charging for water, reforming environmental licensing, converting Cetesb into a more conventional executive agency). Some are borrowed ideas, including at least one (“environmental investor”) from Serra’s short time as mayor of the Municipality of São Paulo (MSP). Taken individually they might not appear that radical or ambitious, but taken together they promise a very full, active and transforming four years in environment policy if fulfilled. A set of mainline and alternative scenarios for how the state might look in 2020 from an environmental viewpoint will be developed looking at several key variables, namely: (1) population; (2) urbanization; (3) influence of global climate change; (4) impact of “principal potentially polluting economic activities” on water resources, air, biodiversity and solid wastes. The preliminary diagnosis of the state’s environmental condition is to be prepared this month, with a set of key environmental indicators to be developed by June 2008 and all the alternative scenarios ready for publication in a report by December 2008. Work on the scenarios will be coordinated by the Environment Secretariat’s (SMA) Environmental Planning and Education Department (Coordenadoria de Planejamento Ambiental Estratégico e Educação Ambiental – CPLEA). Regulations will be adopted to charge large consumers (principally the basic sanitation companies, agriculture and industry) for water use in the state’s 22 hydrographic basins, wiht the revenue generated used for water management directed by a basin committee. [Note: state law forbids passing on the cost of such charges to household water bill.] The goal here is to have by December 2010 (the end of Serra’s term as governor) at least 16 of the basins charging the fees, with two of them (Paraíba do Sul and Piracicaba-Capivari-Jundiai) commencing to do so as early as June 2007. SMA’s Water Resources Coordinator will be in charge of this project. Serra wants to initiate a zero tolerance policy for deforestation, or as he put it, “a moratorium on deforestation.” The State will tighten environmental licensing of projects that might lead to deforestation, make mitigating measures more effective, make fighting deforestation a top enforcement priority of the state’s Environment Police, step up punishment of environmental crimes harming forests and biodiversity. The formal policy instrument for Desmatamento Zero is due to be issued this month. A new monitoring/enforcement system, using satellite imagery to keep an eye on particular high priority reserves (mainly those of native forests), is to be launched by end-2007. The twin goals here are to (1) stimulate tourism in state parks, particularly ecotourism in the Atlantic Forest (Mata Atlântica); (2) get paulistas more involved, via environmental education programs, in protecting the environment. A work plan for it already developed with the Inter-American Development Bank (IDB) will be executed in full by December 2009, with an initial focus on developing proper infrastructure in six state parks and a plan to promote ecotourism in the Atlantic Forest. The state’s environment executive agency, the Environmental Sanitation Technology Company (Companhia de Tecnologia de Saneamento Ambiental – Cetesb), will be in charge of this project. São Paulo is the linchpin of Brazil’s ethanol program, providing over half of present supplies. Unfortunately, not all the practices involved are ecologically sound. For example, the pre-harvest burning of sugarcane releases CO2, CH4, NOx, N2O, CO and PM10 into the atmosphere and harms the respiratory health of surrounding populations. There have been laws, decrees, agreements and court cases trying to phase out the practice since the early 1990s, with minimal success. Serra’s government is making a new go at it. It will seek to have an agreement (“protocol”) signed with all cane growers and sugar-alcohol industry by June 2007 to (1) phase out all pre-harvest burning within 10 years; (2) demarcate and recover 425,000 hectares of mata ciliar (see below) within cane farms. The Administration also will submit by June 2007 a draft law to ban all pre-harvest cane burning. This project will seek to create a state system of norms regarding endangered species, create a system of “reception centers” for captured wildlife, and measures to combat illegal trade in wildlife. A “red list” of endangered animals will be prepared by May 2008, and a draft law on the issue will be presented to the state assembly by June 2008. The first two reception centers will be readied by December 2010. The São Paulo Zoo is to coordinate this project. This project, to be coordinated by the state’s Forestry Foundation, aims to elaborate and approve management plans for all the state’s conservation units (parks, “ecological stations,” “experimental stations,” biological reserves, forests), implementing a “co-management” system, a regularization of the park system and tougher enforcement of protected areas. All 59 protected areas are to have their management plans in place by December 2010. The state will also seek ISO 14000 certification for all the units and for the Forestry Foundation itself by December 2010. The idea here is to create a portfolio of environmental projects in which private investment would be welcomed, and seek to stimulate voluntary partnerships with companies, citizens and environmental NGOs. Serra initiated a similar program when he was mayor of the Municipality of São Paulo (MSP). He wants at least 60% of the state-level projects to be identified to be funded by December 2010. Although the title of this project suggests that it is about reform of environmental licensing in the state, it actually is far more. Yes, it does aim at making environmental licensing 30% faster and much less bureaucratic. But it would do so as part of a major restructuring of the environmental regulation system in the state. Within a year a bill would be sent to the state assembly to transform Cetesb into a more traditional environmental executive agency by 2010, with all state-level licensing unified under the new agency, and to reorganize the State Environment System. Beginning in May 2007 and finishing by June 2008 licensing for water projects will be “regionalized” along basin lines. All projects with strictly local impacts will be devolved to municipalities, with the state helping municipalities to set up their own environmental licensing operations and to train reviewers. The Governor and SMA have fancier ways of saying it, but essentially this project seeks to bring the northern SP coastline under full environmental management and control. This area has several fragile ecosystems under pressure from rapidly growing population (about 5% per year, higher than the state average) and development. This essentially will be the fulfillment of a special program to protect the northern coast that started under the prior (Alckmin) administration. CPLEA has been collecting environmental data, creating a set of special indicators to aid monitoring and developing an integrated environmental assessment of the region. The goal is elaborate a full environmental action and management plan by March 2009. São Paulo has been struggling with this issue for quite some time. By Cetesb’s reckoning, in 2005 80% of the quantity of ordinary solid waste generated in the state received “adequate” disposal (which is so loosely defined that it almost means any “controlled” burial of trash) and all but 24% of the state’s municipalities provide such disposal. Some key existing sanitary landfills, such as MSP’s Bandeirantes, are scheduled to close but their replacements have not been prepared (usually due to local opposition). – adopt regulations on recycling envisioned in the new State Solid Waste Policy Law. This project involves focussed protection, recovery, education and enforcement efforts on three key basins. An implementing regulation for the specific law governing the Guarapiranga was already emitted last month, while drafts of similar specific laws for Billings will be sent to the state assembly this month, and for Cotia, Tietê-Cabeceiras and Juqueri-Cantareira by year-end. SMA will also seek compacts (convênios) with the various municipalities in these basins about cooperating in the protection, education and enforcement efforts. This project will be coordinated by SMA’s Department of Use of Metropolitan Soil (DUSM). The mata ciliar are the vegetation lining rivers, lakes and other bodies of water that help impede the entrance of pollutants into those bodies of water. This project will seek to promote the recovery of mata ciliar in the State, contributing to the expansion of the State’s vegetation cover from 13.9% to 20%. By December 2010 some one million hectares of areas around water bodies are to be interdicted and protected to allow natural regeneration, and another 180,000 hectares will be replanted and/or reforested. The project will (1) create a monitoring/enforcement plan for 500 hectares aligning all important reservoirs; (2) implement restoration projects in 15 micro-basins; (3) propose a draft law on the recovery of the mata ciliar; (4) create an environmental education plan related to the subject. SMA’s work in this area will be coordinated with the State Secretariat of Agriculture. The idea behind this project is to provide the state’s municipalities with added incentive to allocate the resources needed, and adopt the policies, measures and practices necessary to bring themselves up to best environmental management practices. The concept appears based on a program that the northern state of Ceará has had for several years (Ceará even has a special seal that municipalities earn and can use in promoting their city). The SMA will assess current municipal environmental performance, create an index for measuring and reporting such performance, develop a manual of good practice for municipalities and drafting a “Green Protocol” of minima that municipalities must meet in order to be certified by the state as a “green municipality.” Certified municipalities will receive priority in getting state help and funds for things like environmental education and improvements in municipal sanitation. The hope is that certification as a “green municipality” will also attract investors. The goal is to have all cities of over 50,000 inhabitants that qualify to adhere to the Green Protocol by December 2007, and add the smaller cities by December 2010. This project seeks to change public attitudes about key environmental issues and “mobilize” them into taking pro-environment action. SMA’s Education Department, working with the Education, Agriculture and Communication Secretariats and involving environmental entities, will mount three thematic campaigns a year, starting with one in July 2007 against wasting water, a second in September on recycling solid waste, and a third in November on planting trees. This project will get the state government more actively involved in promoting, prioritizing and coordinating scientific research related to environmental issues. Its centerpiece is the creation by June 2007 of a Scientific Council on Environmental Research that will involve all the research organs of SMA, the state Research Foundation (Fapesp), the various state public universities, the private sector and civil society. The Council’s mission will be to double by December 2010 — from 500 to 1,000 — the research programs and projects in the state regarding (1) biodiversity and conservation; (2) global warming and carbon sequestration; (3) new environment-friendly products; (4) bioprospecting; (5) water resources. Execution of the project will be coordinated by the state’s Botany Institute (Instituto de Botânica). This project is what it sounds like: a reorganization/reform of the Secretariat itself, to make it more “efficient, agile, stronger” and more assertive in formulating public policy regarding environment questions. A draft decree on reform is due to be circulated this month. This project’s professed goals are to strengthen monitoring and enforcement of existing air pollution standards, while reducing vehicular emissions through mass transit measures and setting tougher emission reduction and “neutralization” targets for the state’s biggest polluters of the atmosphere — including emissions of greenhouse gases (GHG). By December 2010 SMA will (1) create a full-fledged state inventory of air pollution sources; (2) mandate emission cuts from the 100 industries in the state that emit the most GHG; (3) toughen emission inspection and enforcement; (4) expand Cetesb’s air monitoring station network from 29 to 39; (5) improve the capacity and performance of the entire air quality monitoring network. Serra and SMA reckon that if government entities in the state started buying only certified wood products, made lumber wholesalers and the huge civil construction sector in the state do likewise, and essentially shut state borders to the illegal wood trade, it would have a substantial impact on illegal logging in the Amazon. This project will phase in such measures between now and December 2010, starting with a state seminar on sustainable wood production and consumption and work with the national environmental enforcement agency, IBAMA, on state enforcement efforts regarding wood and use of the feds’ Forest Origin Document (Documento de Origem Florestal – DOF). The state will also propose by March 2008 mechanisms to provide incentives to reforestation efforts. The Serra do Mar is the mountain range lining SP’s coastline (see mini map), much of which theoretically is protected by a giant state park. Unfortunately the park land is being invaded, in part by squatters establishing favelas in park areas near cities such as Cubatão. In the process open-air trash dumps and raw sewage is damaging the park, and encroachments are tearing down vegetation and threatening biodiversity. Authorities want to stop it before the process gets completely out-of-hand, threatening ecosystems and the regional water supplies that the Serra feeds. They are attempting to enforce a freeze on further expansion of favelas into park land, remove existing encroachments and recover the lands they occupied, while launching an environmental education program on the necessity of protecting the park ecosystems. As I suggested at the start, taken individually, most of these projects might seem modest or pedestrian. Considered as a whole, they form a very full environmental agenda that will keep the Serra Administration very busy over the next four years — especially when one takes into account SP’s size in terms of population, area, infrastructure, industry and agriculture, and the strength of its various lobbies. Can the Serra Administration actually fulfill the entire agenda already laid out here in the time frame envisioned? Probably not. It is the nature of governments and politicians everywhere (not just Brazil) to promise more than they can deliver. Serra might be lucky to fulfill 2/3 of these promises, much less all of it. That said, Serra is not a politician to be taken lightly. He has served as the national Planning Minister and Health Minister, and in the latter role was largely responsible for launching Brazil’s noted HIV/AIDS program (including its provision of low-cost drugs to all who need them) and Brazil’s decision to back the negotiations for Framework Convention on Tobacco Control. In each case he had to confront strong opposition from major economic interests (tobacco and pharmaceuticals), so he has proven that he does not shy away from taking on industry when he feels he must. Serra also ran for President in 2002 and would have done so again in 2006 if intra-party maneuvering had not given the nomination instead to rival (and ex SP Governor) Geraldo Alckmin. [Polls indicated that Serra could have beaten Lula if the PSDB had nominated him.] Instead in 2004 Serra sought and won the position of Mayor of the giant Municipality of São Paulo (MSP). He resigned that post in 2006 to run for Governor, winning it easily (the first ever to gain that post in the first round of voting). It is possible that part of Serra’s motive for the 21 projects is to firm up his environmental credentials before running again for President. If so, he will have a vested interest in seeing that visible positive results emerge from this agenda’s implementation over the next three years or so. Stay tuned! It was with great interest that we read the commentaries here by the new Governor of São Paulo, José Serra [Brazilian Social Democratic Party (Partido da Social Democracia Brasileira – PSDB)] regarding the great new strides forward projected in the Environmental Awareness. Many of these programmes have been heralded before but let’s hope that with the meaning behind them now established that action will be forthcoming. We welcome the moves to clean up the Environmental Pollution inventory particularly in Waste Water and Solid Waste Management issues. São Paulo and the State has a leading edge to play here to awaken the Country and Brazil’s neighbours by establishing credentials that will mark its advent into the Premier States of the World. It is interesting to note that Snr José Serra has targeted the Municipal Solid Waste sector in particular. Let us add here that by so doing he has the opportunity to take upon this major initiative by looking at the future rather than the past in treatment processes and management. In this the potential must not have escaped the mind that with Municipal Waste being composed of 85% Biodegradable Matter – otherwise known as Biomass – or plant originated matter – it can be converted very simply and easily and in an Environmentally acceptable manner and exceedingly Economically to the Biofuel ETHANOL. THe quantities that can be produced from the Waste (alone) in the Sate of São Paulo would increase the quantity of Ethanol available to Brazil by 20%. Just think of the ramifications that would have on the economy and in the important area of Exports and the Economy. The proposal offers to the Sate of São Paulo a means to treat waste and convert it to a well sought after product – namely the Fuel Ethanol – at a cost that renders all other treatment processes obsolete. The critical feature is the fact that its capital cost is less than a third of comparable thermal destructive procedures: and more importantly, it produces a product from which the revenue stream would pay off the debts to design build and operate such a plant within 4 to 6 years. We know of no other proposal which will do that! I don’t believe that the new Governor of São Paulo, José Serra, can or should ignore this issue: it is too great for the State, it is too great an issue for the Country and importantly it is of vital importance to the health and well being of the whole of South America.